Caring for someone with a chronic condition can be a relentless experience. 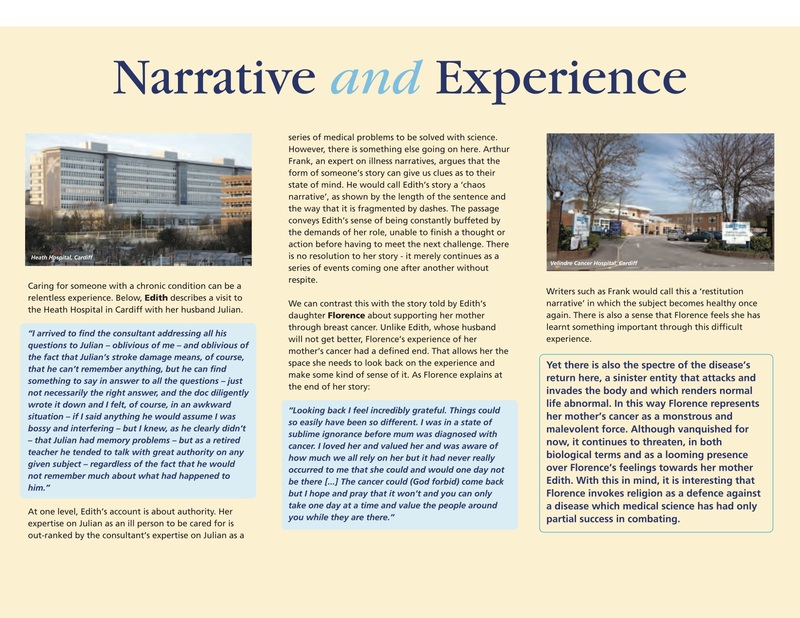 Below, Edith describes a visit to the Heath Hospital in Cardiff with her husband Julian. At one level, Edith’s account is about authority. Her expertise on Julian as an ill person to be cared for is out-ranked by the consultant’s expertise on Julian as a series of medical problems to be solved with science. However, there is something else going on here. Arthur Frank, an expert on illness narratives, argues that the form of someone’s story can give us clues as to their state of mind. He would call Edith’s story a ‘chaos narrative’, as shown by the length of the sentence and the way that it is fragmented by dashes. The passage conveys Edith’s sense of being constantly buffeted by the demands of her role, unable to finish a thought or action before having to meet the next challenge. There is no resolution to her story – it merely continues as a series of events coming one after another without respite. Writers such as Frank would call this a ‘restitution narrative’ in which the subject becomes healthy once again. There is also a sense that Florence feels she has learnt something important through this difficult experience. Yet there is also the spectre of the disease’s return here, a sinister entity that attacks and invades the body and which renders normal life abnormal. In this way Florence represents her mother’s cancer as a monstrous and malevolent force. Although vanquished for now, it continues to threaten, in both biological terms and as a looming presence over Florence’s feelings towards her mother Edith. With this in mind, it is interesting that Florence invokes religion as a defence against a disease which medical science has had only partial success in combating.